Colleges and universities have always been instrumental in bringing about change within our society and attract the future leaders of the world. We are identified by our alma mater and the school we studied is the most important information on our resume. In this study, we tried to rank universities in India in terms of their influence on analytics practice today. We used three measure to rank the universities – number of graduates from the university in analytics practice today, seniority level of these professionals and the company profile they work in. 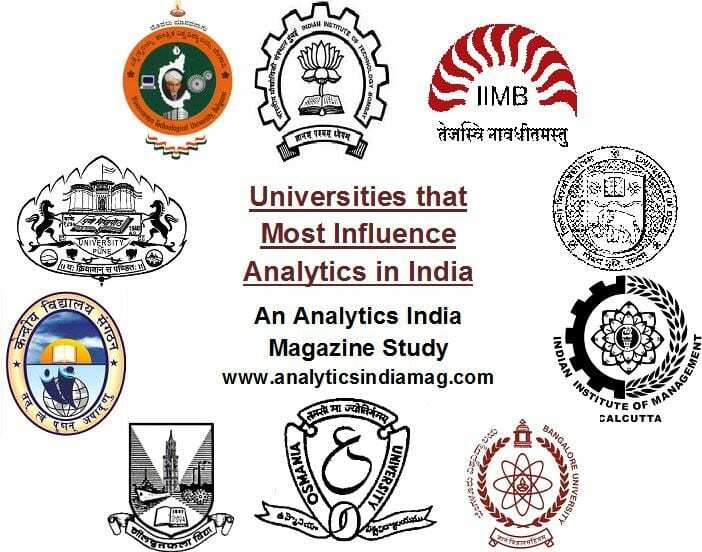 These 10 institutes/ universities account for 21% of all analytics professionals in India. Delhi University scores the highest for number of analytics professionals – 4.1% of all analytics professional in India are from Delhi University. Average work experience for analytics professional from these universities is 7.2 years. IIM Bangalore tops the ranking on account of being highest in seniority level and company score. Top 10 analytics employers from these universities are TCS, IBM, Accenture, Genpact, Cognizant, HP, Infosys, Deloitte, Dell and Oracle. Average company size these graduates work in is 7,267 employees. 6% analytics professionals from these universities are currently holding a designation of VP, 5% Director, 3% are founders/ owners and 2% are at CXO level. 24% of these professionals are based out of Bangalore, 23% in Mumbai and 15% in New Delhi. Pune, Hyderabad and Gurgaon each has 7% of these professionals.